Mom and dad are looking for a relaxing Caribbean vacation, but the kids are looking for excitement? No problem, mon! 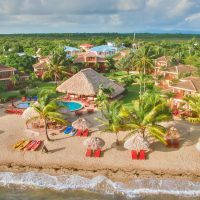 Beaches Negril, located a little over an hour southwest of Montego Bay’s International Airport, is the Jamaican family holiday of everyone’s dreams. The all-inclusive resort is built in an open, airy, plantation-style setting, with meandering pathways through lush tropical landscaping. And while it’s a massive resort, designers have done a commendable job maintaining an intimate tropical feel, with the property broken into several different areas all connected by winding walkways. There are plenty of quiet public sitting areas and the abundant foliage creates a feeling of seclusion between the various buildings where the rooms and suites are located. In short, if it’s a tropical paradise you’re after – and one with one of the best kids’ clubs around – you’ve come to the right place. 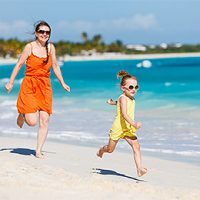 Mom, dad or the grandparents can be beachÃ‚ bums along one of the most beautiful stretches of Jamaica’s famous Seven Mile Beach, where you can enjoy all-inclusive use of water toys such as paddleboards, water bikes and Hobie Cats, as well as snorkeling gear. Younger kids will be in their own paradise at the Sesame Street-themed kids’ club, while teens and tweens will enjoy their own lounges and activities, including a teen nightclub and even an onsite school where they can learn DJing skills. As reggae legend Bob Marley once said, “Don’t worry ’bout a thing.” It’s a mantra that applies to this resort – in spades. 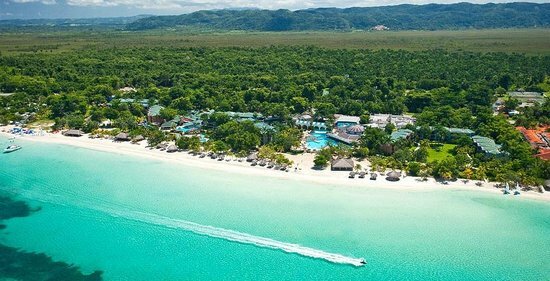 As an all-inclusive resort, Beaches Negril offers complimentary food options, drinks, watersports and entertainment so you can just kick back with beautiful views and do what you came here to do – relax and soak in the care-free Jamaican vibe. Set on 20 acres, this 186-room resort is made up of 10 different room and suite categories to fit a variety of families, including suites that sleep up to twelve with three bedrooms and four full bathrooms. All rooms are tastefully decorated in a Tommy Bahama-ish style with ceiling fans, a balcony or patio, flat-screen TV, mahogany furniture and modern marble bathrooms with baths and showers filled with Red Lane Spa bath amenities. All rooms include air conditioning, an iron and ironing board, coffeemaker, telephone, refrigerator, clock radio, safe, iPod station and hairdryer. Most importantly for a lot of kids, every room comes with an XBox 360 gaming console. The front desk will provide you with games, for a $50 deposit, which is returned to you when the games are returned. Mini-fridges are stocked with all manner of beverages - and if you prefer more juices over beer, all you have to do is lodge that request with housekeeping and they'll sort you out for the rest of your stay. The ultimate indulgence, butler service is available in the largest suites. Your personal butler will pack and unpack your luggage, iron clothes, serve you drinks on your terrace and schedule restaurant reservations. Basically, they are there to handle just about any request. Cribs and rollaway beds are both available on request, free of charge. 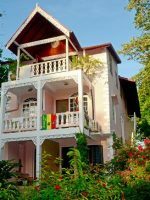 The introductory rooms at Beaches Negril are the Deluxe, which offer garden views, a private patio or balcony, a king bed or two double beds, and sleep three to four people (with the addition of a rollaway). Bathrooms have a shower/tub combination. Located in the Savannah and Santa Cruz gardens, premium rooms also have garden views and are similar to deluxe rooms, with a king bed or two doubles beds to sleep three to four people (with the addition of a rollaway). Beside the location difference, these rooms come with fully stocked refrigerators. Bathrooms have a shower/tub combination. 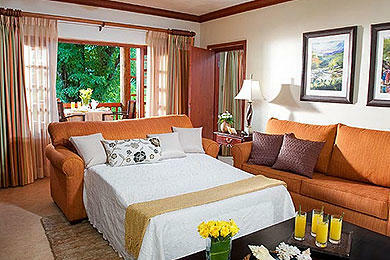 Located near the resort's restaurants, these rooms have garden views, with some providing partial ocean views. Located in the Montpelier building, the rooms have a king bed or two doubles beds and private balcony or patio, and sleep three. Bathrooms have a shower/tub combination. These rooms offer views of the beach and can sleep four people. The rooms have patios or balconies and come with fully stocked refrigerators. There's a king size bed or two doubles beds, and an additional single pull-out sofa sleeper. Bathrooms have a shower/tub combination. The largest of the Luxury category of rooms, these family rooms have two connecting rooms with a king bed in one and two double beds in the second room to sleep up to seven people. There is a single pull-out sofa bed, too. The rooms have garden views with private patios and balconies. Bathrooms have a shower/tub combination. 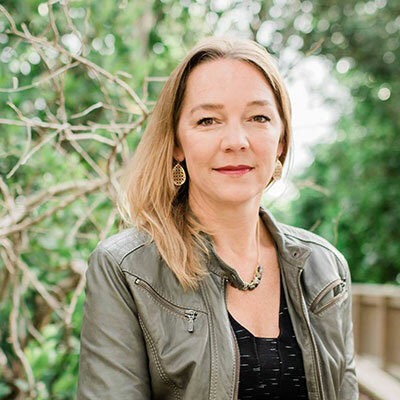 Located in the Savannah and Santa Cruz buildings, as well as the third floor of the Montpelier building, these entry-level Concierge rooms offer views of the ocean and gardens and sleep four. Some rooms have a king four-poster bed, while others have two double beds and a single pull-out sofa bed. Bathrooms have a shower/tub combination. With shoreline views, these beachfront suites can sleep five with a king bed and a sitting area with pullout bed. The rooms have private balconies or patios. Bathrooms have a shower/tub combination. These one-bedroom suites can sleep up to six with a bedroom with king bed and three sleeper sofas (including a twin daybed, trundle and single pull-out sofa bed) in the bedroom and living room. 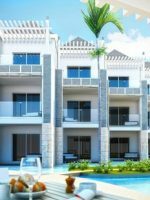 The rooms have beach, garden and ocean views with private patios or balconies. Bathrooms have a shower/tub combination. Located on the third floor of the Savannah, Santa Cruz and Montpelier buildings, these rooms offer a bedroom with king bed and a second bedroom with two double beds. 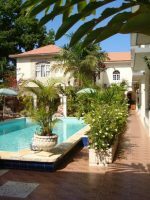 Accommodating up to eight people, the rooms have ocean and garden views. These suites connect two rooms, one of which is a king room with double sofa bed, and the other a room with two double beds. The rooms offer beach and ocean views and can sleep up to eight. Bathrooms have a shower/tub combination. And there are great views of the sea from the balcony. These beach view rooms have ocean view balconies and two bedrooms that sleep eight people. Each room has a king bed and sleeper sofa, and the living area offers another sleeper sofa bed. Bathrooms have a shower/tub combination. A private butler is on call to tend to your family's every need (almost). The largest of the property's suites, the three-bedroom can accommodate 12 people. Three bedrooms have king beds and sleeper sofas, with a living area with two additional sleeper sofas. The rooms offer beach, ocean and garden views, with private balconies and patios. Bathrooms have a shower/tub combination. Again, your private butler is here for whatever you may request. My husband and I went with our 3 year old to Beaches Negril in January. We were initially nervous and almost cancelled due to some negative reviews we had read, especially since we had experienced Beaches Turks and loved it there. We were worried it would not live up to how amazing Turks was. 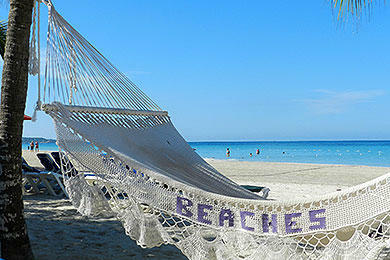 BUT to our surprise, we loved Beaches Negril even more than Turks as did our son! The facilities and room were perfect, we had no issues throughout our stay, and we liked that it was more walkable. The best part that set BN apart was the staff! They were consistently friendly and truly interested in making us and our son enjoy every minute. We especially loved Lesmore, Astina, Maurice, Daniel, Kamala, JoJo, and Patrina!!!!! For the first time ever we actually booked a repeat visit before we left from our stay- that’s how great it was!!! Definitely book a vacation here. I will keep this brief as I do not think people read long versions! Having been twice to Sandles in Negril we decided to take the children (8, 4) to Beaches. We had a concierge room , which very pleasantly got up graded mid trip to a suite. The views are gorgeous and the balcony large enough for us all. The hotel is really good (5 star? No but good) and the rooms are large and suitable. 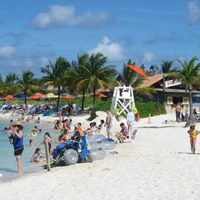 The beach is gorgeous and the pools , water park are great fun for the children. HOWEVER, the food in the Mill (which is a buffet) is at best OK. Not enough children food on. Each day is a different theme , Mexican, Jamaican, European which in theory is a good idea but often the popular dishes were missing and if your child only wants plain food and it is hot food (spicy) then unlucky! The breakfast is good but service to be fair fairly poor (which is really unusual for Jamaica). When i say poor its just not what you would expect for this hotel, its rushed and not personal.The Kimonos was really good as was the Italian although not much choice for children. Now the hotel states that towels on the beds before 7am will be removed and those beds not used in 2 hours would also be removed. Great in theory but it just didn't happen! If you had not got a bed by 7 then you were without. We also witnessed a family of about 6 reserving beds by the pool as well as the beach. The pool beds were never used until the late afternoon!! We paid for our own cabanas for 5 days , at least we got a bed but at $190 a day not everyone wants to spend that money. The evening entertainment was not really up to much with the exception of the SILVER birds who we have seen at Sandles as well and they are very talented. The other issue is with tipping. It states no tipping but in reality that is also not true. Everyone is after a tip and if you give a tip you get treated better and as long as you know that and accept it its fine. Do not misunderstand me it is a good hotel, service and attitude wise not as good as Sandles but the children loved it. The concierge team were really helpful as were the water sports team. We hired our own boat out on 2 occasions and to be fair they could not do enough for us. Would we revisit? Possibly yes. Its very expensive for what you get but a holiday is what you make of itI have tried to be as fair as possible but given it cost over £15,000 (including flights) it really did not make me go wow!! Having said that the children loved it and you not what they say happy children = good holiday! Narrow age ranges at the kids' camp - which is included in your room rates and open from 9 a.m. to 9 p.m. daily - means programs are perfectly tailored to different developmental stages. Counselors in the nursery take care of newborns through toddlers of 24 months, in a brightly colored room filled with cribs, strollers and rocking chairs. There's another room just for 2-year-olds, and a 3- to 4-year-old group that features a letter of the day activity, as well as dress-up parties and sancastle building. The 5- to 7- year-olds have their own activities, including bingo and scrapbooking. Children ages 8 to 10 tie dye T-shirts, do rocket launches and participate in pool games and XBox challenges. Back on land, there's Pirates Island, a water theme park with four slides (two of which you access by a long flight of stairs up for a screaming ride back down), a meandering lazy river and a fun splash pad for the little ones with spray fountains that resemble characters from the film "Finding Nemo." The highlight of Pirates Island is the enormous dump bucket at its highest point - every few minutes, once it's filled with water, it overturns to fabulous effect, absolutely drenching the entire scene. Other land sports include a miniature golf course with some challenging holes in a shaded area near the beachfront, two illuminated tennis courts with complimentary racquets, croquet, table tennis and a playground. The daily schedule always includes a mix of boredom-busting family activities such as beach volleyball, a billiards tournament or reggae dance lessons. And while some of the activities might seen corny, when you participate as a family, it all amounts to loads of laughs. Evening entertainment in the open-air auditorium area near The Mill restaurant is also family-friendly. Some nights feature live cabaret or Jamaican-themed productions with dancers in traditional costumes relaying the history and culture of the island. Other nights, Big Bird and his friends are in the spotlight and small kids take over the stage to dance along with all the familiar Sesame Street characters. If you're in need of a manicure or pedicure, Red Lane Spa offers $35 manicures and $45 pedicures, as well as hair services. Younger guests can indulge with Ginger Lily by Red Lane Spa treatments that include things like manicures and pedicures, facials and massages all designed for pre-teens and teens. For family dining, there's a Sesame Street character breakfast every week (for an extra fee). Additionally, there's the casual barbeque park near the main pool, for a casual feed of things like burgers and jerk chicken from late afternoon till the wee hours of the morning. There are no restaurants onsite that are adults-only. If your child has a certain dietary need, the resort's chefs are open to special requests -- like pureeing potatoes for baby foods or whipping up a healthy option for dinner. Most kiddie menu items are of the chicken finger, hamburger and mac and cheese variety, but chefs will take special requests if you give them advance notice. High chairs are readily available at dining venues throughout the resort, and the staff will quickly run over with crayons and paper to keep the kids occupied. If you want to dine with your kids, the resort's Italian restaurant, The Venetian, is the most popular onsite restaurant for families to spend a destination dinner out together, with pizzas, risottos and pasta dishes on the menu. The restaurant is open 5:30 to 9:30 p.m., but closed on Tuesdays. Reservations are required and the dress code is resort evening attire. The outdoor restaurant near the main swim-up pool bar and Pirates' Island offers BBQ and snacks from 3 p.m. to 3 a.m. This outdoor restaurant is located right on the beach with picnic tables in the sand and romantic sunset views and candlelight in the evenings. Serving Jamaican and Caribbean seafood dishes (including lobster, if you request it in advance! ), the restaurant is open for breakfast (7:30 to 11 a.m.) and dinner (5:30 to 9:30 p.m.). The dress code is resort casual (no bathing suits, but bare feet are allowed for a toes-in-the-sand experience). 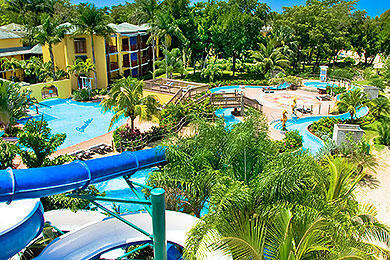 This open-air restaurant is located poolside and serves up international and Caribbean dishes in a buffet setting. Breakfast is offered from 7 to 10:15 a.m., lunch from 12:30 to 2:15 p.m., and dinner from 5:30 to 9:30 p.m. Dress code is resort casual. For Asian dishes and Teppanyaki-style cooking, this dinner-only restaurant requires reservations in advance and is open from 5:30 to 9:15 p.m. It's a loud environment with lots of theater from the chefs as they cook before your eyes. You share the table with other guests. Dress code is resort casual. For Tex-Mex-inspired cuisine during lunch and dinner, this is a pub-style restaurant near the main swim-up bar. The grill is open from 11 a.m. to 3 p.m. daily, and dinner is served from 5:30 to 9:30 p.m. with items like nachos, fish tacos and ceviche on the menu, in addition to standards like fish sandwiches and burgers. Dress code is resort casual. This casual cafÃƒÂ© with mostly outdoor seating is open from breakfast through late night (6:30 a.m. to 10:30 p.m.) with coffee, breakfast pastries, sandwiches and sweets available from a display case.Ã‚Â They make crepes onsite, ice cream is available by the scoop and there's a self-service coffee area where you can get your caffeine hit throughout the day. This place also makes delicious espresso drinks -- the best of the entire resort). For a bit more upscale ambience, Soy is the resort's sushi restaurant and it is excellent - as good as any sushi spot you'd find in a big worldly city. There's indoor seating, but we like the outdoor nooks built like mini Asian pagodas where you can dine surrounded by tropical greenery. While reservations are not required, the busy dinner-only restaurant is only open from 5:30 to 9 p.m. and is popular for date nights. Kids love the tempura dishes. Dress code is resort casual. The kids' favorite, Dino's is the place to go for wood-fired pizza whipped up by a real character of an Italian chef. Open from 11 a.m. to 6 p.m., the restaurant is open-air, with outdoor seating only (some is covered) and overlooks the beach. Beaches Negril has a "No Tipping" policy for its entire staff, except for private butlers Red Lane Spa employees. There is also no resort fee. An onsite gift shop sells a great selection of casual wear, souvenirs, sunscreen and, of course, plenty of Sesame Street-themed toys and other items. Wi-Fi is available in your room for $15 per day or $43 per week. Complimentary Internet access is available in the lobby and surrounding garden courtyard. High season in Jamaica is mid-December through mid-April. You'll find plenty of families visiting over the summer as well, when kids are out of school. You may want to schedule your visit around one of Negril's many events or festivals. 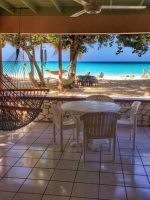 The Bob Marley Birthday Bash is in February, Negril Jerkfest is in November and the Reggae Marathon, which passes right by the resort, is in December. July brings thousands to Sumfest, one of the world's largest reggae music festivals, held in neighboring Montego Bay. Taxis cannot be hailed from the street, but the concierge will order taxis for guests if you wish to explore Negril town, about a five-minute drive away. 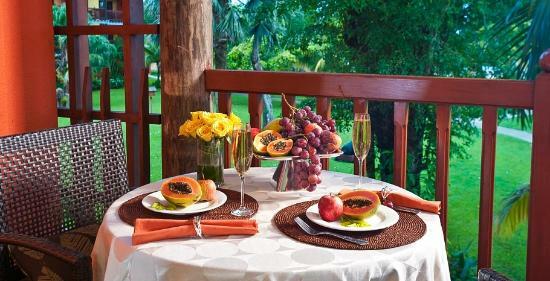 Red Lane Spa offers a menu of couples treatments either in the spa, at a secluded seaside cabana or in your own suite. Fun hits a high note at the adults-only Seville Piano Bar Sing-Along, held three evenings per week. 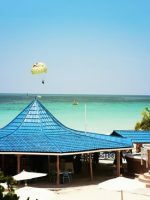 For an off-property excursion for just the two of you, head over to Negril's West End to watch the cliff divers do their thing at the legendary oceanfront bar, Rick's CafÃƒÂ©. Or opt for a more sophisticated cocktail and lobster dinner overlooking the cliffs at the exceptional Rockhouse.